Buy Gilding Tools for sale here. Amazing Gold Leaf Tools like Gilding Tips, Water Sizing Brushes, Gilders Dusting Mops, Gilders Burnishing Tools and more. These Gilding Products have been designed over the centuries. 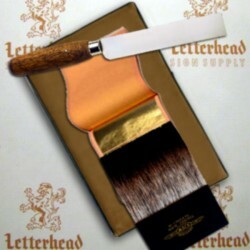 Plus we also carry many modern replacements and new gilding Brushes and Tools. We're a mom and pop business selling the gold leaf gilding tools we've used over the years that have yielded great results. These gilding tools are for gold leaf application, gold leaf burnishing, gold leaf dusting and gold leaf finishing. Brushes Box Premium All Wood KitBuy Brushes Box Premium All Wood Brush Kit for Sale here. Use as a Sign Painters Kit, Gilding Box or as a Pinstriping ..
Gilding Cushion GermanBuy Gilding Cushion German Made in Germany for Sale here. This Gilding Pad or Cushion is 5 1/2" wide by 9 1/2" long and has a ..
Glass Cutter - Pen HandleThis Carbide tip Glass Cutters come in Pistol Grip & Pen grip, both will do the same job, & both may be fill with..
Glass Cutter - Pistol GripThis Carbide tip Glass Cutters come in Pistol Grip & Pen grip, both will do the same job, & both may be fill wit..
Pounce Pad-Han SeeHan See Pounce Pad is most popular Pounce pad. Over the years, thousands of sign artists have used it for trucks, windows, and s..
Hansee White Pounce Powder 16oz - Han-See Pounce Powders Developed exclusively for the Sign Painting-Making and Graphic Industry. A unique blend of Ha..
100% Pure Charcoal Pounce Powder Sold in 1 pound amounts- Traditional Sign Painter Pounce Powders Developed exclusively for the Sign Painting-Making a.. 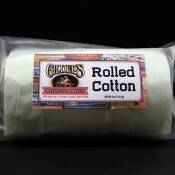 Replacement Tips for the Etching & Burnishing Pen Sold IndividuallyFiberglass tips. Used to create a fade in water gilding. Water gild with y.. Wipe Out Tool Series 2240If you over run a corner or edge, this wipe out tool can pull or push the paint away to make a perfect edge or corner. O..